← Who Cooks for You!? As a discussion group of personal historians, we weren’t exactly Cameron’s target reader—no retirees here. We were most of us already on our “second acts,” busy with creative and fulfilling work helping others capture and share their life stories. Our book club’s purpose was to examine the usefulness of Cameron’s approach in our own businesses. Some of us anticipated working her methods into our own workshop curriculum. Others were just considering adding teaching to our services, and a few were indeed thinking about scaling back to where personal creativity could thrive in balance with remunerative work. We met regularly to discuss each chapter, with one individual volunteering to read and report each time. Like the original The Artist’s Way, each chapter dealt with recovering (or reigniting) a sense of something missing in one’s life, adding up to a twelve-week curriculum. Safety, Identity, Power, Integrity, Possibility, Abundance, Connection, Strength, Compassion, Self-Protection, Autonomy, and Faith. Wonder, Freedom, Connection, Purpose, Honesty, Humility, Resilience, Joy, Motion, Vitality, Adventure, and Faith. Where the themes of the original book dealt with the doubts that might confront a young person attempting to hang onto a creative flame as the tide of adult responsibility rises, the second book deals in themes that correlate with the developmental stages of later life. Each chapter ends with prompting questions for that memoir, and each week/chapter the prompts guide the student through life’s arc from earliest memory to summing up. The memoir prompts seemed derivative of Dr. James Birren’s prompts in Telling the Stories of Life through Guided Autobiography Groups. Our group found parts of the methodology suitable for use in our work with clients, whether one-on-one or in group workshops, but as a whole, it seemed absolutely overwhelming for a 12-week curriculum. (The same can be said for the original Artist’s Way process.) Spending a year on it, with a month devoted to each chapter, seemed like a more appropriate pace. We disbanded our discussion group after six months, but not before having a number of interesting conversations, including how one might expand a personal history practice using the Life Coaching model and curriculum like Cameron’s. There is a deep relationship between finding meaning in one’s own life experiences at times of transition and wanting to share the stories that hold that meaning. Today’s life coaching client may become tomorrow’s memoirist. Our group’s final meeting took place exactly one year ago, June 21, 2018. I assume the others were as melancholy as I was about losing the “Wonder, Freedom, Connection, Purpose, Honesty, Humility, Resilience, Joy, Motion, Vitality, Adventure, and Faith” we found in sharing our experiences with each other, guided by the loose structure of Cameron’s Never Too Late. I must admit, I didn’t find enough to like about Never Too Late to recommend it with enthusiasm. In the end, it didn’t matter that the book was not a revolutionary breakthrough or a work of staggering beauty. It brought some people at midlife and beyond together, and engendered some discovery of creativity and meaning. Nothing wrong with that. p.s. What have you read lately that might interest readers of True Stories Well Told? You too can write a book review! Drop me a line–sarah.white@firstpersonprod.com. This is great. I wondered about this book too, having read The Artist’s Way. I was part of a group who met after a class on The Artist’s Way. We met for 10 or so years before the group finally dissipated. 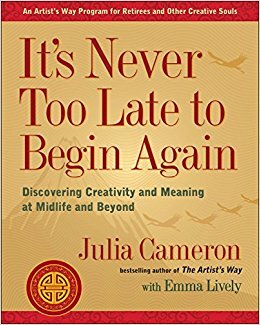 I wonder if Julia Cameron knows how many personal connections she’s forged through her books.